LiveU video transmission solution for G1 Formula motorsports. Hackensack, NJ, April 2018: Griiip, manufacturer of the ground-breaking G1 Formula cars and founder of the new G1 Series for drivers aspiring to reach Formula 1, has teamed up with LiveU to create a paradigm shift in the way that motorsport is covered, both in terms of technological simplicity and cost reduction. Griiip set out to provide dynamic, premium quality coverage, which is in no way possible using traditional broadcast technology and quickly identified LiveU’s as the ideal partner. Both Griiip and LiveU want to bring viewers back to watching and engaging with motorsport, starting with G1. The first race of the G1 Series – in many ways a pilot event – took place in Northern Italy (where the whole series will take place) over the weekend of the 14th/15th April. The race was streamed on a dedicated website to attract both new and existing motor racing fans. Future races will also be available on Facebook Live. Each car had an ultra-small LU200 portable transmission unit from LiveU on it, attached to a GoPro™ camera that was in turn attached to two microphones. A flagship LU600 unit was used for wider coverage of the event. For future events, like the race on May 20th, viewers will be able to select individual driver feeds on the G1 Series website. Griiip is also intending to use drones to expand coverage of the races. 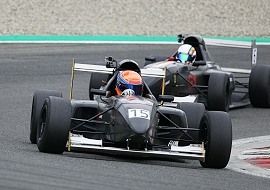 When developing the new entry-level Formula - based on the US Formula 1000 regulations – Griiip identified two clear issues: being able to bring even entry-level Formulas to a wide audience with cutting-edge live coverage without breaking the bank; and massively reducing the cost of the entry-level Formula experience. Getting to the top in motor racing has become prohibitively expensive. Griiip’s new G1 Series provides a hi-tech stepping stone by creating an entry-level formula that doesn’t compromise on quality but massively reduces the cost. Griiip has created a high-performance car that can be bought for only €52,900 (they can also be leased) and can be operated by a small team, with low life-cycle cost, rather than the very expensive team of specialists required in other Formulas.